When you are ready to take on a new painting project or finish an old one, then you are going to need to find some useful solutions. Finding a paint sprayer can be overwhelming when faced with all the options, but it doesn’t have to be. Consider purchasing a Campbell Hausfeld paint sprayer to get your jobs done quickly. I’ll review for you the ways these tools can help you to complete a high-quality project. Campbell Hausfeld is a Marmon/Berkshire Hathaway company that was started in 1836. The humble beginnings consisted of creating agricultural equipment that would make the life of a farmer easier. In 1940, they began producing air compressors to help the industry in America. In 2016, they celebrated their 180th anniversary. By becoming a leader in the home improvement industry, they now offer a full line of air compressors, staplers, paint sprayers, nailers, pressure washers and welders to consumers. Their focus is on delivering a high-quality product while finding new and innovative ways to put the machinery to work. The expert staff provides a deeply committed level of customer satisfaction to all users. By using a Campbell Hausfeld product, you can be assured that you’ve received a well-made product that will get the job done right. Depending on the project you are tackling, there is a Campbell Hausfeld Spray gun that should work for you. Another big question is whether you want an airless paint sprayer or HVLP sprayer. Many people will actually choose to own one of each. An HVLP paint sprayer uses air that is pumped from the compressor or turbine. That causes the paint to atomize and apply smoothly. With an Airless paint sprayer, the piston is responsible for pressurizing your materials. These will then spray from the tip into smaller particles than with the HVLP sprayer. An airless paint sprayer is geared more towards big and flat surfaces. You would use this for your walls, siding, and general household projects. The HVLP paint sprayer is best for fine finishes and detail work. Deciding what kind of sprayer is best for you will help you to determine which Campbell Hausfeld sprayer to purchase. Check out our detailed reviews of three popular Campbell Hausfeld sprayers to see if one of these would be right for you. This airless sprayer is made in the USA and requires no compressor. It can be used efficiently for your interior or exterior work and sprays a variety of coatings thanks to the ergonomic spray gun. Campbell Hausfeld offers a lifetime warranty on the motor and the pump to give you peace of mind. The built-in bucket leveler is a great option for your paint bucket. You can use this unit with a 1 or 5-gallon paint bucket. The flexible suction assembly is equipped with prime booster for faster starting. It also includes a 25-foot high-pressure hose, but you can easily upgrade that to up to 100 feet. This will help you reach anywhere to complete your painting projects fast. The ¾-horsepower diaphragm pump will spray at up to 0.34-gallons per minute at 3000 PSI. That means you can paint large surfaces in a fraction of the time of many other sprayers. It is made with a solid aluminum block and brass fittings for long life. In addition, the TEFC electric motor has a completely enclosed fan cooled design to offer a safer operation. It provides enough power to spray most oil and latex based materials with ease. This sprayer comes with a tip size of 0.015 in. but, you can use a slightly bigger tip. The long-life cartridge valves allow you to maintain your sprayer easily at a lower cost. Keep in mind that this sprayer is almost 60 pounds, but, it comes with semi-pneumatic tires to make transportation a breeze. When you are in need of completing your automotive painting, carpentry painting or other household projects, you may find this Campbell Hausfeld Gravity-Feed Spray Gun Kit to be useful. This HVLP, high-volume low-pressure design will allow you to reduce paint waste while delivering an accurate result. The kit includes 2 spray guns, 2 adjusting valves, 5 inline paint filters, 10 paint filter, 3 cleaning brushes, a metal file, coupler, PTFE thread tape and even a wrench. The carrying case that comes with the gun kit makes it easy to store and tote to various locations. Beginners will find that this kit is a great way to get started. It can be used for touch-ups around the house or even several larger projects. With the 2 included spray guns, 2.1 SCFM and 0.7 SCFM, you’ll need 40 PSI to operate. The gravity-feed spray gun features a 550ml canister while the touch-up spray gun offers a 120ml canister. With low overspray and fine atomization, this spray gun offers controls to adjust the fluid and air flow. You can adjust the spray pattern with easy dial settings. The 600ml gravity feed design offers easy cleanup and minimal waste. The polished aluminum housing is also helpful in aiding that quick clean-up you desire. This can be used for automotive painting as well as furniture and more. You can spray most light to medium viscosity materials. This includes primers, enamels, lacquers, base coats, polyurethane, clear coats and urethane topcoats. It will require 4.0 SCFM at 40 PSI and the canister can hold 20 ounces of material. Your gun also includes 2 in-line paint filters, a wrench, a 6mm hex wrench and a cleaning brush to get you started. There are several industries or DIY areas that this gun is specifically designed for. If you are an auto enthusiast, you’ll find that this spray gun will save you money as well as time. In marine applications, you can use it for the varnish on the wood or the paint needed on metal material. Architecturally speaking, it can apply drywall mud in thin coatings. You’ll find uses for it indoor or outdoors. 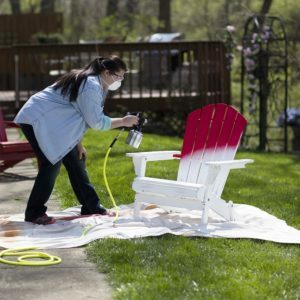 The low overspray makes it perfect for areas where you have multiple items in the vicinity of your painting tasks. When you are looking to finish furniture, you will find that the low pressure allows you to hold this spray gun closer to the surface. This is helpful when applying either varnish or lacquer. You’ll end up with a more exact coverage than if you were using other tools. No matter what task you are looking to accomplish with a paint sprayer, there is a Campbell Hausfeld product that is right for you. With a reputable company to back the product, you know that you are in good hands with whichever option you choose.